How Do You Prevent Concrete Cracking and Spalling? How do you prevent the concrete around your new home from spalling? It is a question for the ages, a question that has been asked by home buyers before you and will be asked by home buyers long after you are gone. The simple answer – you don’t. Most contractors will tell you they will guarantee your concrete for two things – that it won’t get stolen and that it will crack and spall. Unfortunately, there are to many variables in both the laying of the concrete and the maintenance of it to control. The variables to be concerned with when laying concrete include the grade of concrete, the air temperature when it is laid, the water content, how it is worked and how fast it dries to name just a few. When it comes to maintenance, things to consider are how often it is plowed if you are in a climate with snow, if salt or other chemicals are used to melt the snow, if it is sealed regularly and if fertilizer sits on it for long periods of time. Generally, most engineers will recommend a 4000 psi concrete for patios and driveways. Contractors such as UpDwell Homes use 4000 psi while some will still use 3500 psi or lower. It is also generally best to pour concrete when outside temps are between 40 to 60 degrees. This allows the concrete to cure as slow and evenly as possible. The ideal is that the water in the concrete will dry and evaporate equally out of both the top and the bottom. For this reason it is also good to pour concrete when there is as little wind as possible. The reason flat workers will put control joints in the cement when laying it is to try to get the cement to crack along those lines when it does crack because it will. Because driveways and patios are laid on dirt and or some type of fill there is always going to be some settling and heaving. When this happens, the concrete will crack. Generally this does not mean there were issues in laying the concrete is just means the ground underneath is changing and shifting. Spalling is when the top smooth surface of the concrete flakes off and reveals the rough, rocky under layer. Spalling generally occurs when water works its way to below the surface of the concrete and then freezes, expands and pushes the surface up and away. This most often happens when snow is left on the concrete and even driven over again and again and then melts, seeps into the concrete and freezes. Spalling can also occur when salt or other chemicals are used to melt the snow. These chemicals can weaken the surface of the concrete and cause it to flake off. Learn more about spalling at http://www.concretenetwork.com/fix-spalled-concrete/fixing-a-spalled-driveway.html. You can reduce the amount of spalling by sealing your concrete every year. While sealing it will not completely eliminate spalling, it will help reduce the potential for it occurring. The general rule of thumb to remember then, is that your new concrete probably will crack and spall at some point. 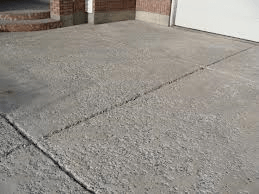 Pouring it under optimum conditions, using quality concrete and keeping the snow off of it and sealing it regularly will help prevent the severity of cracking and spalling and will help your concrete look like new for as long as possible.